Jonathan Muhiudeen started sailing relatively late in life, in his mid-twenties. After learning from books he borrowed from the library, he put theory into practice at the Royal Selangor Yacht Club in his native Malaysia. His “sabbatical” from a successful career as a banker stretched into a four-year circumnavigation. The nightlife, the fancy watch, sports cars…all traded for salt in his rainbow. The author is one of the few Asian circumnavigators to have written a book about what it’s like to be from a non-western country and sail into foreign ports. With no real practical experience when he began crewing, Muhiudeen bluffed his way through the first year. Leaving home as a captain of a 75-foot cutter, and with almost no blue water or mechanical experience, the first half of the book recounts a baptism of fire. While sailing around the world, mostly as a paid crew, captain, engineer or cook but sometimes just seeking passage from others, the author’s adventures include storms, a shipwreck, and romance. By the second half of the book, he’s comfortable both at sea and in strange ports. He returned home an experienced ocean sailor and a totally changed man. Jonathan Muhiudeen lives in Piedmont, CA, and sails with his wife Linda and two boys whenever he can. 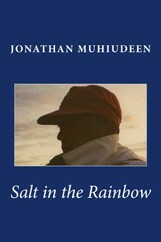 A fascinating tale by a great storyteller, Salt in the Rainbow is available on Amazon.com in paperback, or in ebook format for $8.50. The author’s Facebook page, facebook.com/saltintherainbow, has plenty of photos from his adventures and information about his other books.